What is Slow Feed Non-Skid Dog Bowl? 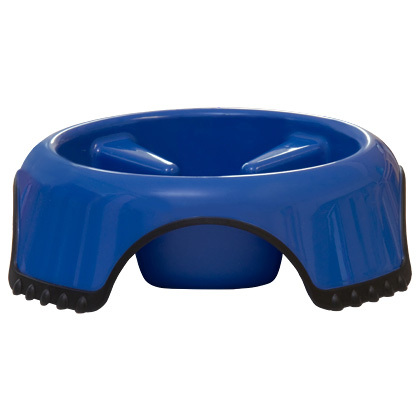 The Slow Feed Non-Skid Dog Bowl is designed to keep your pet from eating his or her food too quickly. It is made out of durable, heavy-duty plastic and a non-skid bottom, so your pet doesn't have to chase his or her food around the room. It comes in Medium and Large sizes. See "Details" for measurements. The Slow Feed Non-Skid Dog Bowl has dividers built into the bowl to stop your pet from gulping down food too quickly and potentially getting sick. These dividers make your pet work around the bowl, which slows down their eating process. The rubber bottom keeps the bowl in place, which reduces spilling. Just place the Slow Feed Non-Skid Dog Bowl on the floor and fill it with your pet's recommended food amount. The bottom rim is covered in a thermoplastic rubber so you can place it on tile, linoleum, and wood floors and not worry about it skidding around. The Slow Feed Non-Skid Dog Bowl is only dishwasher safe when it is placed in the top rack. Polypropylene with a Thermoplastic Rubber base.